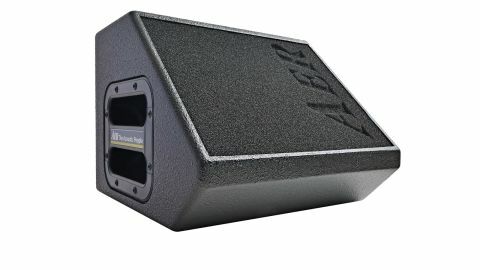 Reconfigured wedge version of AER's Compact 60/3: an essential stage buddy! Good control over sound. Nice effects. Works well as a monitor and backline. Great build. This wedge-shaped 'Slope' isn't a new amp as such, just a reconfigured version of the well-loved AER Compact 60, now in its third generation. It's a highly transportable, lightweight (6.5kg) two-channel acoustic amp with 60W of output from a single eight-inch twin-cone speaker. As usual, all the controls run along the top, back edge of the amp. "Overall, then, it's an easy amp to use, either as backline or a monitor, or both, with an excellent sound"
Channel one has a standard jack input with three-band EQ, plus a colour switch (a mid-cut/treble- boost), high/low input selection and LED clip monitor. Channel two features an XLR/jack combi input, with line/mic input selection, LED clip monitor and two-band EQ. The four digital effects (two reverbs, delay and chorus) are global via the pan control, which also allows you to mix in any external effects. Finally, we have an overall master output control. On the back are outputs for headphones, tuner, line and DI outs, plus an effects loop. Crisp, clean and highly detailed are all terms we associate with AER, and this is no exception: a superb acoustic amp. It's such a well-sorted amp that getting a sound from virtually any instrument we had to hand was easy. It doesn't have a huge number of bells and whistles in the EQ department, but the colour switch adds an instant modern edge to steel strings and the EQ overall sounds very guitar-specific. It's worth mentioning the effects, too: two clean and spacious reverbs - the second with a longer tail, a delay with a 320-millisecond repeat, ideal for adding a little 'air' to solos, for example, and a perfectly usable 'rock' chorus. Via a footswitch, you can switch the effects (either the internal effects or any you have in the external effects loop) on or off. The wedge format proves highly useful. It's ideal as an onstage monitor (you don't have to suspend your amp on a mic stand or chair), as it's throwing the sound to your ear. On bigger stages, it proved handy to complement the onstage monitor mix. We used it as a personal monitor and adjusted the volume when things got louder without affecting the out-front balance or bothering the soundman. Having an accurate, quality sound helps your playing, too - not always the case with a PA's monitors! Many of us are perfectly happy to plug into a PA and trust its EQ and monitors to produce the sound we want to hear. But if you want more control over your sound, an acoustic amp is definitely the way to go. Placement of any acoustic amp is always important to prevent feedback, but in this wedge format the Slope really could be a life-saver on stage as both a powerful amp and monitor in one. Be heard!